U.S. President Donald Trump speaks at the National Assembly in Seoul, South Korea, November 8, 2017. Trump is in South Korea as a part of his five-country tour of Asia. Before winging off to Beijing, Trump managed to convince his staff and Korean President Moon to take him to the demilitarized zone (DMZ). Many of his aides were said to have been wary about the idea, fearing he might make some kind of provocative statement at this famous line of demarcation that was temporarily drawn by an armistice agreement in 1953 after the Korean War. For him to miss this unusual irredenta where a visitor can stand within an inch of DPRK sovereign territory—so close that one could (if one dared) actually reach out and touch a North Korean guard—was evidently too much to abjure. Alas, with Trump already on-board a Chinook helicopter, foggy weather finally prevented him from landing at the DMZ. This reversal of plans was probably just as well, because heavens knows what Trump might have said about “Little Rocket Man,” once he had gained proximity to his unformed minions just across the fabled frontier. 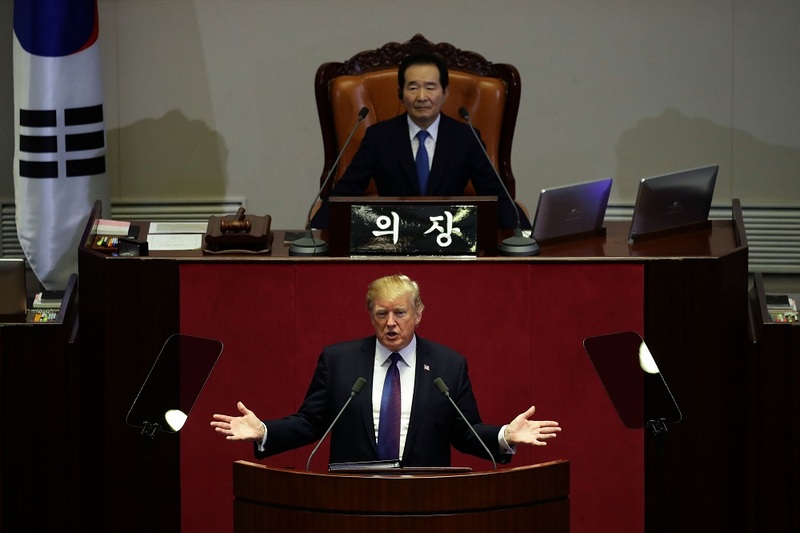 Instead, Trump had to settle for the far less adventurous—and potentially far less disruptive—task of giving a speech to the Korean National Assembly. He also put all countries who have been in any way aiding and abetting North Korea on notice. In a sense he delivered a clarion challenge to China, reminding President Xi Jinping that it is in China’s interest, and its responsibility, to lean into the task of isolating the DRPK. If Trump will be courting Xi in Beijing, he will also be courted by him, and President Xi will be at something of a disadvantage. So, before the glow of his tryst with President Moon has quite cooled, Trump is already ginning up the flattery machine for his third target, making it seem almost as if he were back at one of his famous beauty contests, with each candidate appearing on stage and receiving de rigeur compliments on their physiques, hobbies, personalities, and, not to be forgotten, the charm of each of the states from which they hail. Unlike Europe, where many sophisticated Western leaders found Trump so repellant that they stepped back from him, unwilling to be caught in too ardent an embrace with such a man, their Asian counterparts have gone full-out to win him. With no apparent reservations about wooing him, each has gone into high-pander mode, using whatever flattery they feel necessary to win the favor of this famously perfidious and thin-skinned American potentate. Despite his newly consolidated power and legendary skills to awe visitors with pomp, majesty, and ceremony, since he is the third suitor to court Trump on this trip, Xi starts late. Moreover, whereas Prime Minister Abe and President Moon as “allies” were both able to project a warm mien in their courtship, Xi’s famously cool, opaque, and aloof Communist countenance only adds to his handicap. After all, he represents an increasingly autocratic form of Leninist capitalism that is very much at odds with American conceits about the democratic nature of our society. This fundamental contradiction between our political systems and values creates a steady background dissonance which infects all aspect of the U.S.-China relationship, including Trump’s relationship with Xi. However often Trump may tweet his admiration for autocrats or deride democratic institutions, in myriad ways that are difficult to measure, profound differences limit the degree to which “friendship”—or even the simulacrum of “friendship”—is credible between Trump and Xi. Even when trump acclaims Xi as a “terrific guy” or “like a king,” a part of Xi must suspect that because we are still from such opposite political systems, Trump must be being somewhat disingenuous. If one looks at Trump’s tripartite courtship of the leaders of Japan, Korea, and China, the advantages enjoyed by China are its size, wealth, power, and new aggressiveness. But these advantages also come with liabilities. As an increasingly ominous autocratic regime that rules through intimidation and chauvinism, China is hardly the cuddly panda it sometimes likes to project. As successful as it sometimes appears to have been in terms of its dynamic developmental power, with the U.S. it hardly inspires the same warm feelings of relaxed fraternity enjoyed by Japan and Korea. So, today, as Trump left Seoul, he exited the embrace of the U.S.-Asian alliance and entered a very different world: the universe of Xi Jinping’s one-Party system and the People’s Republic of China, a country that is neither ally nor enemy, partner nor adversary, friend nor opponent. What it is more, what it has become, has grown increasingly unclear as it has adopted an ever more aggressive posture abroad and a more authoritarian posture at home. President Trump’s challenge is to see whether it is still possible to re-catalyze this most critical of all relationships in some new way that enables the two countries to work together toward more convergent goals. It is a tall order, and taller still for two leaders as different and as similar as Trump and Xi. But whether Xi’s conceit that the two countries should form a “new kind of big power relationship,” or Trump’s grandiose notion of winning China over in a grand alliance on the dangers of North Korea are enough to change the paradigm, is another question. Mao Zedong and Zhou Enlai teamed up with Richard Nixon and Henry Kissinger when both saw a common interest in opposing Moscow. Until Xi, never a global risk-taker, comes to see in Pyongyang as much of a threat as Trump does, it is doubtful the two will end up going down in history as true game-changers. In any event, we should have a clearer sense of the possibility before Trump leaves Beijing on Friday to fly off to Vietnam.